For a while the mighty Nvidia GeForce GTX 680 2GB was the rockstar king of the single GPU graphics cards market; lady graphics cards screamed and feinted as it walked by while lesser cards looked on jealously at its beefy specs list and GPU Boost feature. Soon however there was a challenger to the throne, the mysterious and unexpected AMD Radeon 7970 3GB GHz Edition sallied forth, armed with a Catalyst 12.7 beta driver (counts as a +2 Longsword). What we’re trying to say - in a faintly ridiculous and roundabout way - is that there is currently a power struggle at the top of the GPU market. 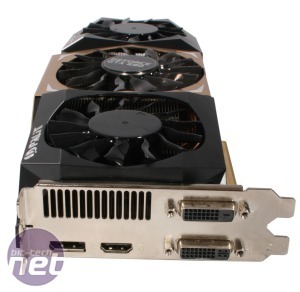 It’s not one that seems particularly fair however, as AMD have arguably had two bites of the cherry; the HD 7970 3GB GHz Edition is essentially just a souped-up HD 7970 3GB that was released by AMD specifically to spoil the GTX 680’s party banquet. 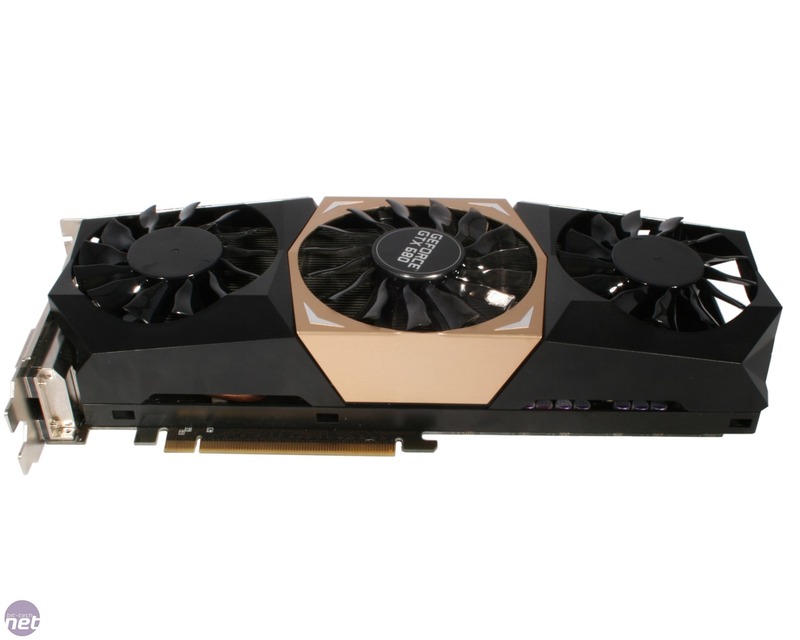 To even things up then we’ve decided to look at a factory overclocked GTX 680 2GB, the Palit GTX 680 JetStream. As a factory overclocked card, the Jetsream improves on the clock speeds you’ll see from a stock GTX 680 2GB - the GPU runs at a base clock speed of 1,084MHz and has an increased boost threshold of 1,150MHz. These are gains of eight per cent and are complemented by a 75MHz increase in the base memory clock, leading to an effective memory speed of 6.3GHz - a 300MHz effective boost. These clocks are a little way behind those that we achieved when overclocking a stock GTX 680 2GB, but to guarantee their stability over time, Palit has still felt the need to upgrade the power circuitry of the card. As a result, the JetStream sports one eight-pin and one six-pin power socket compared to the dual six-pin arrangement that we saw on the reference Nvidia design. To deal with the extra 75W of juice that this change introduces Palit has also beefed up the power circuitry; the JetStream features a 6+2 VRM system rather than the 4+2 of the stock card. Naturally more power and higher clock speeds mean more waste heat, so like many factory overclocked cards the Palit sports a fancy custom cooler, in this case the titular JetStream cooler. As you can see, this is a triple fanned beast which has a distinctive, angular stealth bomber look to it that we quite liked. The air of stealth is lost slightly once you hit the power button however, as the fans on the cooler are LED models and light up bright blue when active, which you’ll either love or hate. The sheer heft of the cooler raises some issues too, as it’s tall enough to impede on the two expansion slots next to your chosen 16x PCI-E slot. Triple slot coolers aren’t as outrageous an idea as they used to be of course, but it could be a deal breaker if you’ve got a lot of expansion cards or use a m-ATX board where expansion slots are at more of a premium. Nestling under the fans is a large bank of aluminium fins that is fed heat from the GPU by four chunky copper heatpipes. So far so good then, but if you’re a long time reader, you’ll expect this to be the bit where we tell you about the hefty price premium that Palit are expecting you to pay for all the goodies we’ve outlined above. You’re expecting to read it, then chuckle quietly to yourself, knowing that you, as a savvy consumer, would never pay this, instead just getting a stock model and overclocking it yourself. Palit really don’t seem to have read the script here, however, as the JetStream is priced at £400 - exactly the same price as you can pick up a stock GTX 680 for. This is phenomenal value and turns the idea of a pre-overclocked card being something of an extravagance on its head. Despite this, the JetStream is still under pressure to justify that price tag, as pre-overclocked versions of the HD 7970 3GB retail for around £340 to £350. 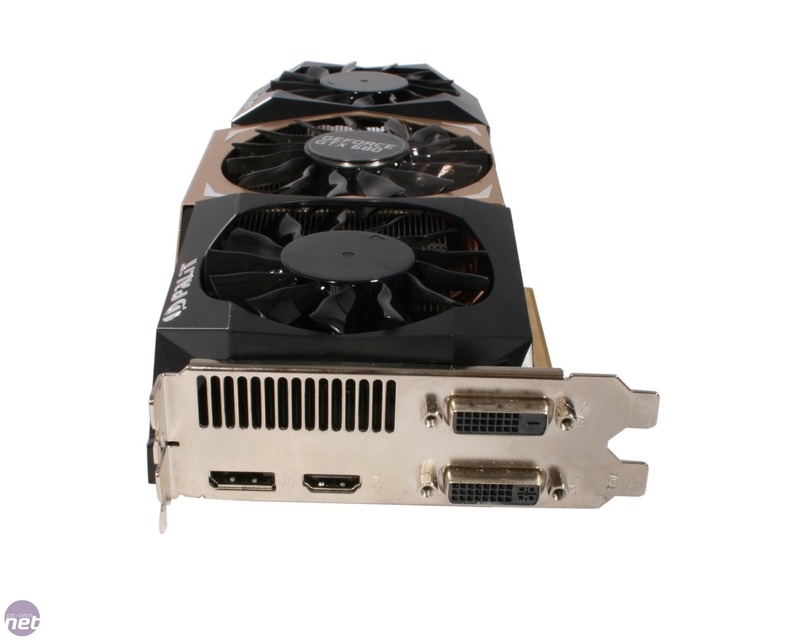 Graphics processor: Nvidia GeForce GTX 680 2GB, 1,084MHz base clock, boosting 1,150MHz minimum. UEFI GOP BIOS provides quick-load support. New beta driver promises up to 15 per cent boosts. Sapphire is claiming its Radeon HD 7970 TOXIC Edition 6GB board is the fastest single-GPU card around.